From Compile Heart, the developer of the reasonably popular Hyperdimension Neptunia series, comes a new game from a fresh intellectual property. MeiQ: Labyrinth of Death is the story of a world that is suffering an eternal nighttime. Legend tells the story of a chosen Machina Mage who must turn the key to restart the world and restore order. The world of MeiQ is made up of five parts, and a mage has been selected from each part to partake in the quest. Enter the cast. The Huntsman: Winter’s Curse is a PlayStation 4 game based in the same universe as The Huntsman film series. Billed as an “episodic role-playing game with card collecting elements”, the game follows the story of a girl, Elisabeth, who goes on a quest in an attempt to save her brothers from the corruption of the Ice Queen. 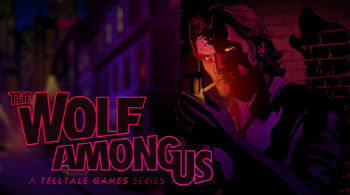 Telltale Games has released the latest episode of The Wolf Among Us across Europe, subtitled The Crooked Mile. With the success of The Walking Dead, Telltale have high expectations to reach with The Wolf Among Us, but episodes 1 and 2 proved that they were up to the challenge. Readers of Culture Shack will know how much I love this series, you can read my full review over at Filmoria.